This board is a crystal oscillator with output pulse amplifier. The frequency is stable to .01% over 0 to 55C. Frequency may be specified from 5kc to 2 mc (Current units 5kHz to 2 MHz) and is stamped on the crystal can. This board is 10 kc and makes a high pitched whine when operating. 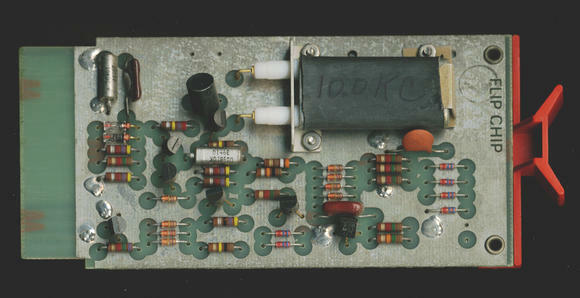 This board cost $100 in 1968.